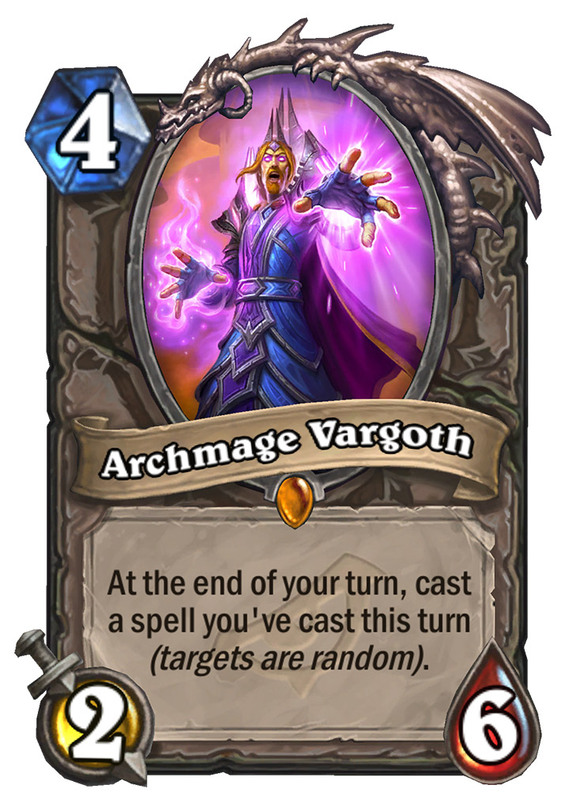 Archmage Vargoth will be the free Legendary card that everyone will get ahead of the release of Rise of Shadows. Looks pretty powerful, versatile, and should be fun to play as well. I can't wait! He has enough health to hopefully stay on the board for another turn if played on curve (or if you boost it with a spell after playing it in the late game), and even if not, you may already get reasonable value even if the effect only triggers once. Beware though that you can't (safely) use The Coin the same turn you play Vargoth (nor any later turn while he is still on the board). We'll be looking for spells which specifically target friends or enemies to avoid shooting ourselves in the foot. From a lore perspective, I'm surprised that this is not a Mage card though. - Permanently freezing the enemy board with Frost Nova as the only spell you've cast. Since Spiteful Summoner worked back then (a bit to well) this might too. Serious potential on this one! As far as I know, freeze effect doesn't stack, so it's not going to work. Nice way to protect Vargoth himself, however you'll end up with 6 overloaded mana crystals, meaning you won't be able to do much on the following turn (except attacking with an army of flying toads, that is). Seems difficult to achieve. You obviously can't play both Vargoth and Mind Control on the same turn. If you want Vargoth to survive long enough, you'll have to control the board first, and if you control the board, casting Mind Control twice in the same turn is probably not going to be useful. There will always be corner cases of course, but in general Mind Control does not strike me as a spell that will combine with Vargoth particularly well. This won't work i guess, since he say "a spell you've cast this turn." He will not recast Frost nova each turn, if you dont play any more spells. he will just freeze already frozen enemies in the same turn, and thats it. If you follow up next turn without any spell, he will not do anything. I don't this card will work except some niche situations. You can't play a targeted spell with this, RNG might destroy you. You don't want to cast anything cheap, because it is not enough value to include him. Apparently board clears are a thing in HS, but do any of those decks want to add a 4 mana 2/6 for some *possible* value? We will see I guess. At the very least it's a good and easy combo with draw spells to refill a hand. I can also see it dropping into a rogue deck, to recast deadly poison, sinister strike, etc that can only target a specific point. I can also see it dropping into a rogue deck, to recast deadly poison, sinister strike, etc that can only target a specific point. Yeah, or Mind Blast in Aggro Priest. 10 points in your face at round 6 sounds lovely. Well that and it's a high-ish HP minion that your opponent absolutely has to get rid of in a hurry, burning their spells and minions to do so. Eh... A couple free Burgle (or similar effects) might make for a fun deck when you just want to chill off and play for fun.